Improper battery rotation was costing DSC Logistics big money. 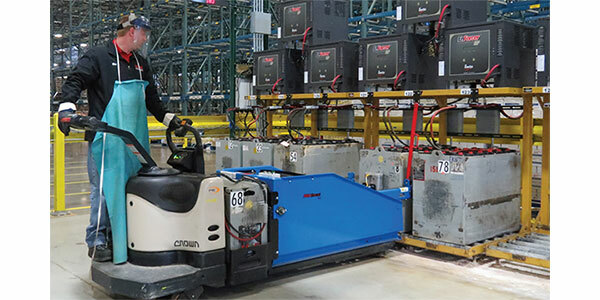 An automated lift truck battery management system put a stop to that—and paid for itself in a few weeks. Old habits die hard ... especially when it comes to swapping out lead-acid lift truck batteries. Observe forklift operators in a battery room, and you're likely to see them do one of two things: walk up and down the aisles looking at batteries before choosing the one that looks newest, or nip inside and grab the battery that's closest to the entrance. It's hard to blame them for going either of those routes. Most people will assume that the newest piece of equipment will be the best performer. And operators don't want to spend more time "out of the saddle" than they have to, especially if their pay is based on productivity. Understandable as those habits may be, they almost guarantee that operators will fail to choose a battery that has been properly charged and fully cooled. That's a problem, because routinely selecting and using the "wrong" batteries will cause their performance and longevity to degrade. That, in turn, translates into more frequent changes during a shift as well as the need to keep a larger number of batteries on hand. Until three years ago, that was the situation at the University Park, Ill., distribution center (DC) operated by the third-party logistics (3PL) company DSC Logistics. When managers noticed a pattern of unusually frequent changes and shorter-than-expected battery life, they found that incorrect battery selection was to blame. After their original solution produced disappointing results, they turned to an automated battery management system that not only eliminated those problems but also paid for itself in a matter of weeks. The 575,000-square-foot DC operates three shifts five days a week, handling mostly dry and some refrigerated food at the pallet, layer, and individual case level. University Park has a fleet of 45 forklifts, including 22 standup counterbalanced trucks, 11 standup deep-reach trucks, one order picker, and four pallet jacks, all manufactured by Crown Equipment Corp. (The balance are short-term rental trucks.) The fleet is powered by a pool of 85 batteries, all of them purchased from EnerSys, including a single model for all of the standup counterbalanced and deep-reach trucks. That degree of standardization pays off by simplifying vehicle maintenance and operator/technician training; it also helps to keep purchase prices reasonable, says Jim Chamberlain, DSC's senior director of industrial engineering and continual improvement. While reviewing reports in DSC's labor management system (LMS) some years ago, Chamberlain and his colleagues noticed that lift truck operators frequently made more than one battery change per shift. Short battery run times were compromising productivity, but that wasn't the only problem. There also appeared to be a correlation between the frequent changes and the batteries' shorter-than-expected lifespans. Observation revealed that improper battery selection was to blame, so the operations and industrial engineering teams came up with a "first in, first out" process to help drivers choose batteries that had been charged and fully cooled. In the battery changing area, there would be one empty storage slot; drivers were told to always put their used battery in that slot and take the fresh one immediately to the right. "In theory, if everyone [follows the procedure], drivers will never get back to the battery they just put in until they have come all the way around [the storage slots]," Chamberlain explains. But even with that simple visual system, compliance was spotty, he says. This method produced limited improvement, so DSC asked its battery supplier for ideas. EnerSys suggested an automated battery management system that could address all of its customer's concerns. The automated battery management system installed by EnerSys, called EZ Select, ensures that all batteries are evenly rotated. "The system monitors the chargers, and when a charge is complete, that battery goes into a queue organized by cool-down time," explains Paul Roeser, national accounts manager for EnerSys. At DSC's University Park facility, when an operator enters the battery changing area, he or she uses an automatic battery-change cart to insert the depleted battery into an empty slot before hooking the battery up to a charger. Next, the operator looks at EZ Select's light-emitting diode (LED) display panel, which is mounted on a pole at one end of the battery-charging area. The display panel indicates the number of the charger position where the next available properly charged (and longest-cooled) battery is located, Roeser explains. The operator uses the cart to extract the fresh battery, rolls it back to the lift truck, and installs it in the vehicle. If an operator attempts to take a battery other than the one indicated on the screen, an alarm immediately sounds. The battery management system also applies a date and time stamp to the error, a feature that identifies which operators are making the mistakes. That allows DSC to coach employees who need more training, an approach that quickly paid off. "Now, the employees get it: If we all follow this, then we'll all get good batteries," Chamberlain says. "It's actually fostered more of a team mentality." Before EnerSys and DSC turned on all the system's capabilities, they ran it "blind" for a week, recording activity but without providing any instructions to operators. The purpose was to get an accurate baseline of operators' current behaviors. The results, in Chamberlain's description, were "startling." It turned out that operators were choosing the right battery only 3 percent of the time. The system documented that they were choosing whichever battery was closest, most convenient, or newest. The blind test, moreover, showed why run times and life spans were so short: The average cool-down time for the batteries the operators selected was just two hours, Chamberlain says. The automated battery management system, together with operator training, has helped DSC Logistics all but eliminate battery-selection errors. When the system was first installed in 2012, the accuracy of battery selection soared to over 96 percent from 3 percent, and the average cool-down time for each battery rose to 10 hours from two. As a result, Chamberlain says, "We are getting proper run times now ... We've pretty much gone from two to around one change per shift." Those changes have also improved average battery life spans. "We conservatively estimate that we put an additional six months on a battery's life with this system," but it can be considerably more, depending on the circumstances, says Roeser of EnerSys. Automated selection has also reduced the time spent changing batteries at the University Park DC by 430 hours annually. There are two reasons for that, Roeser says: Operators no longer walk around looking at batteries before deciding which one to take, and the number of battery changes per shift has been greatly reduced. Because all of the batteries are properly charged and cooled, more of them are available for use at any one time. That has allowed the three-shift operation to cut down on the number of batteries it maintains per truck from 2.5 to just over two. An EnerSys analyst monitors the data the EZ Select system uploads daily. The vendor uses that information to identify potential problems with batteries or chargers. Based on trend data, the company can recommend an action plan to drive out costs, Roeser says. Chamberlain notes that this type of analysis allowed the system, which required an initial investment of less than $24,000, to essentially pay for itself in just one month. To accommodate additional business, DSC had been planning to add another lift truck to its fleet. "With the information from the battery management system, we realized that we already had a healthy ratio of batteries to trucks, and that we could add a truck without buying any additional batteries, chargers, or stands," he recalls. According to EnerSys, DSC achieved savings of $25,000 in the first year after installation and is projecting annual savings in future years of about $31,000. That was enough to convince Chamberlain and his colleagues to spread the word about the benefits of automated battery selection. "We have this system now in 11 of our logistics centers," he says. "Our goal is to continue rolling them out because they have had such a positive impact on our business." The system's impact extends well beyond time and cost reduction, in Chamberlain's view. "Our customers are always challenging us to improve what we do for them and how our business is run," he says. Automated battery management has helped DSC meet that expectation. "What it has done is take something that for us was subjective and inconsistent, and turned it into something controlled and standardized," he says. "There really isn't a downside."